Various. See sizes & prices below. Available in 12 standard sizes. Comes complete with passive ventilation for totally silent air control. Supplied with an acoustic door with a vision panel and lock and is rated to a dB(A) reduction 30. 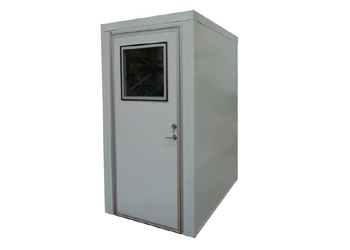 Quietroom Isolation Booths have an overall airbourne sound insulation figure of 34dB. Complete with internal lighting and cable passages. Constructed from tough and durable materials. Suitable for use in domestic applications as well as commercial. New purpose made economical acoustic booths and sound havens offering 34dB of sound insulation from inside or outside noise. These noise havens that can also be used as acoustic enclosures have been specifically designed by Swedish soundproofing experts to offer an acoustic refuge from otherwise noisy environments as well as being suitable as a soundproofed room where privacy may be required. Available in various sizes, the smaller booths come ready assembled whereas the larger booths are delivered in kit form for easy assembly on site. These acoustic havens have a wide range of uses and are suitable as music recording studios including vocals and drums, meeting rooms, broadcasting, voiceover, translation, instruction, audiology, educational, industrial, equipment testing and call centres among others. The panels of QuietRoom Booths are 50mm thick with the exterior powder coated steel in white for a durable, long lasting finish. Internally they have a ceiling height of 2.2m and externally 2.25m high. The internal skin is made equally as tough but with a perforated surface covering sound absorbing mineral wool that will help absorb sound reflections within the booth making them ideal for recordings or meetings where privacy is important. These internal faces are easy to keep clean and because they are sound absorbing, do not require any additional acoustic treatment unless bass noise sound absorption is required. If these are required, check out our Acoustic Corner Traps and Cubes. The booths also include a lockable aluminium soundproofed door (seen left) with a vision panel that can give vision through the door for safety. Also included is a passive, noiseless ventilation system (Seen right) to enable a more comfortable working environment. The larger soundproofed booths include vision panels to allow more light into the room. Unlike other acoustic sound havens or booths, these are light and airy and unlikely to create the claustrophobic feeling many enclosed spaces can give. This makes them ideal workplaces where a degree of sound insulation is required without that feeling of fatigue that can often occur. Each one is made to order and usually delivered within a few weeks from receipt of order. These soundproofed QuietRoom booths are easy to install and take apart should it be necessary to move them to a new location and are assembled using special profiles for airtight seals on joints and self-tapping screws that are provided with each booth. Also provided are full assembly instructions. Click the link on the right hand side of this page to access the technical specs. Each acoustic booth will have electric lighting and a sound resistant cable passage to allow cabling to enter the booth from outside (Left). 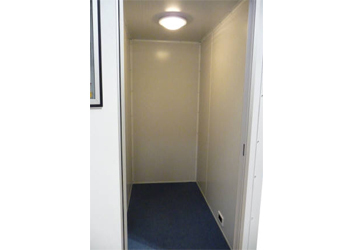 If electrical fittings are not required we can also supply the booths without them at a reduced price but electrical fittings not supplied as part of the kit must be installed by experienced electricians. 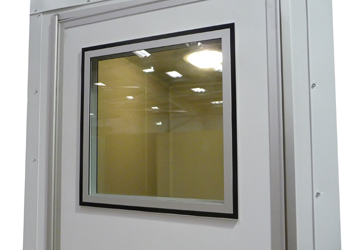 Bespoke acoustic enclosures using the same modular panels can also be supplied. Call us for a quote. Kit includes - Acoustic Door with Vision Panel and Lock, Ventilation System, Fixings. Nominal weight is 350kg total. Nominal weight is 415kg total. Kit includes - Internal Lighting, 1 Cable Passage, Acoustic Door with Vision Panel and Lock, Ventilation System, 1x 900x900 Window, Fixings. Nominal weight is 550kg total. Nominal weight is 615kg total. Nominal weight is 750kg total. Nominal weight is 815kg total. Nominal weight is 950kg total. Nominal weight is 1020kg total. Nominal weight is 1160kg total. Nominal weight is 1300kg total. Nominal weight is 1380kg total. Nominal weight is 1650kg total. The following are also available if you wish to tailor the acoustic booths to your individual requirements. Note! This product will be made up according to the size required from our range. 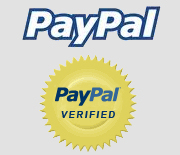 Because this product is tailored to customers requirements, we cannot offer any refunds for its return.